Tabouleh salad can be made in a variety of ways, using all kinds of different ingredients to suit your personal taste. The classic tabouleh salad, which is both quick to make and healthy to eat, can be made in the following way. half a cup of olive oil. Next dice half a cup full of onion and chop half a cup of mint leaves. Then take a teaspoon of black pepper and five plum tomatoes, which have been seeded and cut in half. Take the Bulger wheat and place it in a bowl. Let it stand for approximately 40 minutes before removing any excess water. Afterwards take a fork and turn over the rice. Next put all the remaining ingredients in with the Bulger rice and blend. Finally leave to stand for at least half an hour, as this will help bring out the tabouleh salad's flavour. This will be enough to serve approximately 6 people. A variation on the above salad is to add 2 onions, a red or green pepper, a cucumber, a chopped garlic clove, 3 ears of corn, 4 tablespoons of thyme and 3 tablespoons of red wine vinegar. For this you will need one and a half cups of water which after boiling you add the bulger wheat before turning off the heat and letting it stand for approximately 40 minutes, by which time all excess water should have been absorbed by the rice. The corn ears need to be steamed until they are tender.This should take no more than ten minutes. Then add the corn kernels, along with the onions, pepper, tomatoes and cucumber to the bulgur rice and blend together using olive oil,vinegar and lemon juice. Then add in the mint and thyme before continuing with the blending. Alternatively, it is possible to use boiling water, in place of water that is merely warm, and after pouring the boiling water over the bulgar rice, until it is fully submerged, let the rice stand for approximately 2 and a half hours. By this time the rice should have taken on a fluffy appearance. Then, after removing all excess water, gently blend the other ingredients and place in the chill section of your refrigerator for approximately one and a half hours. The tabouleh salad should then be ready to serve. If you wish, you can serve on a bed of lettuce. 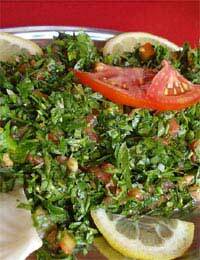 Tabouleh is often thought of as a good balanced diet containing good amounts of carbohydrates and fibre. It is possible to eat tabouleh salad either on its own, as a main dish, or if you prefer as a side dish making great use of lean meat or beans. Some people use shrimps, muscles or prawns to give their tabouleh salad a sea food twist.